شهرکی, افسانه, نصرتی ششکل, بابک, محبی گرگری, رحیم, عبدوس, مجید. (1395). بررسی افزودن نانو ذرات رس و سازگارکننده بر خواص چندسازه حاصل از آرد چوب تاغ (Haloxlon)/ پلی‌پروپیلن. مجله صنایع چوب و کاغذ ایران, 7(3), 335-348. افسانه شهرکی; بابک نصرتی ششکل; رحیم محبی گرگری; مجید عبدوس. "بررسی افزودن نانو ذرات رس و سازگارکننده بر خواص چندسازه حاصل از آرد چوب تاغ (Haloxlon)/ پلی‌پروپیلن". مجله صنایع چوب و کاغذ ایران, 7, 3, 1395, 335-348. شهرکی, افسانه, نصرتی ششکل, بابک, محبی گرگری, رحیم, عبدوس, مجید. (1395). 'بررسی افزودن نانو ذرات رس و سازگارکننده بر خواص چندسازه حاصل از آرد چوب تاغ (Haloxlon)/ پلی‌پروپیلن', مجله صنایع چوب و کاغذ ایران, 7(3), pp. 335-348. شهرکی, افسانه, نصرتی ششکل, بابک, محبی گرگری, رحیم, عبدوس, مجید. بررسی افزودن نانو ذرات رس و سازگارکننده بر خواص چندسازه حاصل از آرد چوب تاغ (Haloxlon)/ پلی‌پروپیلن. مجله صنایع چوب و کاغذ ایران, 1395; 7(3): 335-348. این تحقیق، با هدف بررسی تأثیر نانو ذرات رس و مقدار ماده سازگار کننده روی ویژگی‌های فیزیکی و مکانیکی چندسازه چوب پلاستیک حاصل از آرد چوب تاغ/ پلی‌پروپیلن انجام گردید. بدین منظور، آرد چوب تاغ با نسبت وزنی 50 درصد با پلی‌پروپیلن مخلوط گردید. مالئیک انیدرید پلی‌پروپیلنی به‌عنوان سازگار کننده در دو سطح 0 و 3 درصد و ذرات نانو رس در سه سطح 0، 2 و 4 درصد به‌عنوان پرکننده مورداستفاده قرار گرفتند. فرآیند اختلاط مواد در داخل دستگاه اکسترودر انجام شد و نمونه‌های آزمونی با استفاده از دستگاه قالب‌گیری تزریقی ساخته شدند. سپس آزمون‌های مکانیکی شامل خمش، کشش و ضربه و آزمون‌های فیزیکی شامل جذب آب و واکشیدگی ضخامت مطابق با استانداردهای ASTM بر روی نمونه‌ها انجام گرفت. جهت بررسی نحوه عملکرد ماده سازگار کننده از طیف‌سنجی (FTIR) استفاده گردید. مطالعه ریخت‌شناسی نانو چندسازه‌ها با استفاده از آزمون اشعه ایکس (XRD) و میکروسکوپ الکترونی پویشی (SEM) انجام گردید. نتایج نشان داد که با افزودن مقدار نانو رس تا 4 درصد، خواص فیزیکی و مکانیکی بهبود یافت، اما مقاومت به ضربه کاهش یافت. همچنین با افزودن ماده سازگار کننده خصوصیات مکانیکی و فیزیکی بهبود یافت. نتایج طیف‌سنجی مادون‌قرمز نشان داد که با افزودن سازگار کننده مقدار گروه‌های هیدروکسیل در اثر پیوند با مالئیک‌انیدرید و تشکیل گروه‌های استری کاهش یافت. همچنین بررسی ریخت‌شناسی نانو چندسازه به کمک روش پراش اشعه ایکس نشان داد که توزیع ذرات نانو رس درزمینه پلیمری از نوع بین لایه‌ای بوده و با افزایش مقدار نانو رس، فاصله بین لایه‌ها افزایش می‌یابد. نتایج حاصل از میکروسکوپ الکترونی پویشی نیز حاکی از بهبود در فصل مشترک بین الیاف و ماتریس پلیمری با افزودن سازگار کننده بود. Chavooshi, A., Bahmani, A. A., Mootab Saei, A., Mehrabi, E. and Gholipour, M., 2012. The role of wood and paper industries management of Iran in sustainable development. Journal of Conservation and Utilization of Natural Resources, 1(3):79-95. Abolfathi, M. and Hamedinejad, A., 2008. Fluctuations in the production of timber and development of wood industry in last half century. The 1st Iranian Conference on supplying raw material and development of wood & paper industry. 40p. Barzegar Shiri, M. and Akhlaghi Amiri, Z., 2009. Use of the waste of agricultural for manufacturing the composite product. International conference of cleyne agriculture, University of agricultural and national resources of gorgan. 125-130. (In Persian). Stark, N. M. and Rowlands, R. E., 2003. Effects of wood fiber characteristics on mechanical properties of wood/ polypropylene composites. Wood Fiber Sci, 35:167–174. Nachtigall, S. M. B., Cerveira, G. S. and Rosa, S. M. L., 2007. New polymeric-coupling agent for polypropylene/ wood-flour composites. Polymer Testing, 26:619–628. Shakeri, A. and Omidvar, A., 2006. Investigation on the Effect of Type, Quantity and Size of –Straw Particles on the Mechanical Properties of Crops Straw-High Density Polyethylene Composites Polymer. Iranian Journal of Polymer Science and Technology, 19(4):301-308. (In Persian). Nourbakhsh, A., Kargarfard, A., Golbabaei, F. and Kouhpayehzadeh, M., 2014. Investigation on mechanical and thermal properties of giant milkweed (Calotropis persica) fibers -plastics composites. Iranian Journal of Wood and Paper Science Research, 29(1):106-116. (In Persian). Toghraei, N., Azizi Heris, E. and Parsapajouh, D., 2009. Anatomical characteristics of saxaul wood (Haloxylon) in Iran (Sistan-Baluchestan province). Pajouhesh & Sazandegi, 81:2-12. (In Persian). Ghotbifar, A.R., Kazemi Najafi, S. and Behrooz Eshkiki, B., 2010. Influence of Concentration of Compatibilizer on Long-term Water Absorption and Thickness Swelling Behavior of Polypropylene, Wood Flour/Glass Fiber Hybrid Composites. 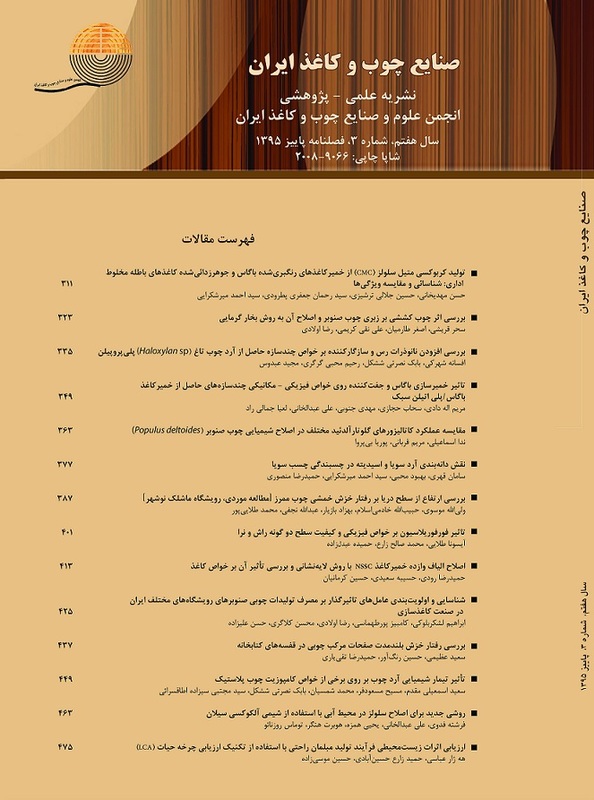 Iranian Journal of Wood and Paper Industries, 1(1):67-78. (In Persian). Semsarzarzadeh, M.A., Mehrabzade, M. and Salehe, M., 1999. Maleic Anhydride Reaction of HDPE and Preparation of High Impact HDPE by Using Calcium Carbonate. Journal of Polymer Science and Technology, 1(2):37-44. Khademi Eslam, H., Yousefnia, Z., Ghasemi, E. and Talaeipoor, T., 2013. Investigating the mechanical properties of wood flour/polypropylene/Nano clay composite. Iranian Journal of Wood and Paper Science Research, 28(1):153-168. Arbelaiz, A., Fernandez, B., Cantero, G., Llano-Ponte, R., Valea, A. and Mondragon, I., 2005. Mechanical Properties of Flax Fiber/Polypropylene Composites; Influence of Fibre/Matrix Modification and Glass Fibre Hybridization. Composites Part A: Journal of Applied Science and Manufacturing, 36(12):1637-1644. Hisrove, V.N., Vasileva, S.T., Krumova, M. and Michler, L.R., 2004. Deformation Mechanisms and Mechanical Properties of Modified Polypropylene-Wood fiber Composites. Journal of Polymer Composites, 25(5):521-526. Adhikary, K.B., Pang, S. and Staiger, M.P., 2008. Long-term Moisture Absorption and Thickness Swelling Behavior of Recycled Thermoplastics Reinforced with Pinus radiata sawdust. Journal of Chemical Engineering, 142(2):190-198. Ichazo, M.N., Albano, C., Gonzalez, J., Perera, R. and Candal, M.V., 2001. Polypropylene/wood flour composites, treatments and properties. Third International Conference on Composite Science and Technology, 54(2-3):207-214. Kord, B., 2010. Investigation on The Effects of Nano clay Particles on Mechanical Properties of Wood Polymer Composites Made of High Density Polyethylene-Wood Flour. Iranian Journal of Wood and Paper Science Research, 25(1):91-101. (In Persian). Tjong, S.C., 2006. Structural and Mechanical Properties of Polymer Nano composites. Journal of Material Science and Engineering, 53(3-4):73-197. Fu, J. and Naguib, H.E., 2006. Effect of Nano clay on the Mechanical Properties of PMMA/Clay Nano composites Foams. Journal of Cellular Plastic, 42(4):325-342. Wu, Q., Lei, Y., Clemons, C.M., Yao, F., Xu, Y. and Lian, K., 2007. Properties of HDPE/Clay/Wood Nano composites. Journal of Plastic Technology, 27(2):108-115. Jahromi, G.k., Andalibzadeh, B. and Vossough,Sh.,2010. Engineering Properties of Nanoclay Modified Asphalt Concrete Mixture. The Arabian Journal for Science and Engineering, 35(1B):89-103. Han, G., Lei, Y., Wu, Q., Kojima, Y. and Suzuki, S., 2008 .Bamboo-Fiber filled height density polyethylene composites: effect of coupling treatment and Nano clay. Journal of Polymers and the Environment, 16(2):123-130. Asif, A., Roa, L.V. and Ninan, K.N., 2007. Hydroxyl terminated poly (ether ketone) with pendant methyl group-toughened epoxy ternary Nano composites: preparation, morphology and thermo mechanical properties. Journal of Applied Polymer Science, 106(5):2936-2946. Wang, L., Wang, K., Chen, L., Zhang, y. and He, C., 2006. Preparation, morphology and thermal/mechanical properties of epoxy/Nano clay composite. Composites Part A: Journal of Applied Science and Manufacturing, 37(11):1890-1896. Younesi Kordkheili, H. and Kazemi Najafi, S., 2011. A Comparison between Steam and Water Absorption Behavior in Polypropylene-Wood Fiber Composite. Iranian Journal of Wood and Forest Science and Technology, 18(2):129-134. (In Persian). Chowdhury, J.A. and Wolcott, M.P., 2007. Compatibilizer Selection to Improve Mechanical and Moisture Properties of Extruded Wood-HDPE Composites. Journal of Forest Products, 57(9):46-53. Sun, Q., Schork, J. and Deng, Y., 2007. Water-based Polymer/clay Nano composite Suspension for Improving Water and Moisture Barrier in Coating. Journal of Composites Science and Technology, 67(9):1823-1829. Alexandre, B., Marais, S., Langevin, S., Mederic, P. and Aubry, T., 2006. Nano composite based polyamide 12/montmorillonite: relationships between structures and transport properties. Journal of Desalination, 199(1-3):164-166. Kord, B. and Taghizadeh Haratbar, D., 2014. Influence of fiber surface treatment on the physical and mechanical properties of wood flour-reinforced polypropylene bionanocomposites. Journal of Thermoplastic Composite Materials, 1–14. Banks, W.B., Din, R.H. and Owen, N. L., 1995. Fiber activation and subsequent CO- polymerization. Journal Holzforchung, 79(2):104-107.